With the fall season here, winter squash varieties line the market. 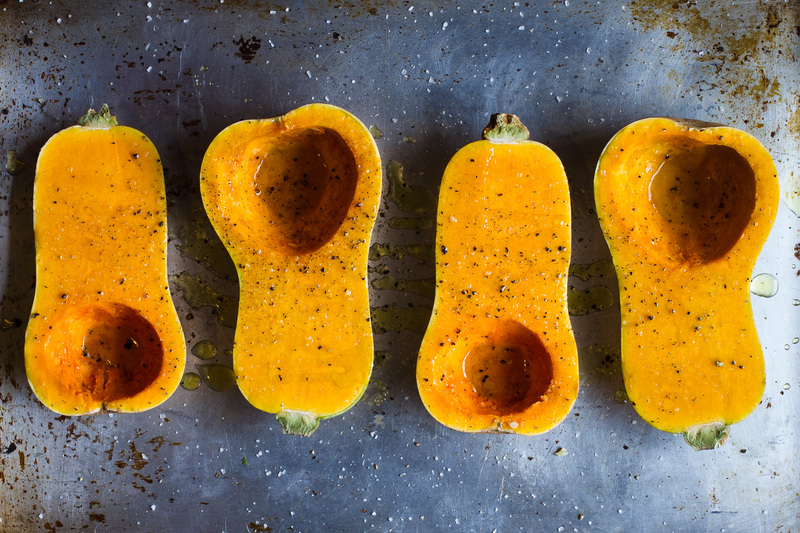 And, if you’re anything like me, you have forty of every kind of butternut, kabocha, kuri, pumpkin, and delicata, which is to say entirely too much squash. My usual go-to solution is almost always soup because Soup Math says stuff + liquid + blender = soup. Boring but easy (hey, I’m a consultant. I’m about solutions). But, butternut squash is one of my favorite winter varieties. It has a long shelf-life, is all #healthy, and has a naturally sweet flavor that shines when roasted. I feel like I owe it to do more than another bowl of soupy banality. 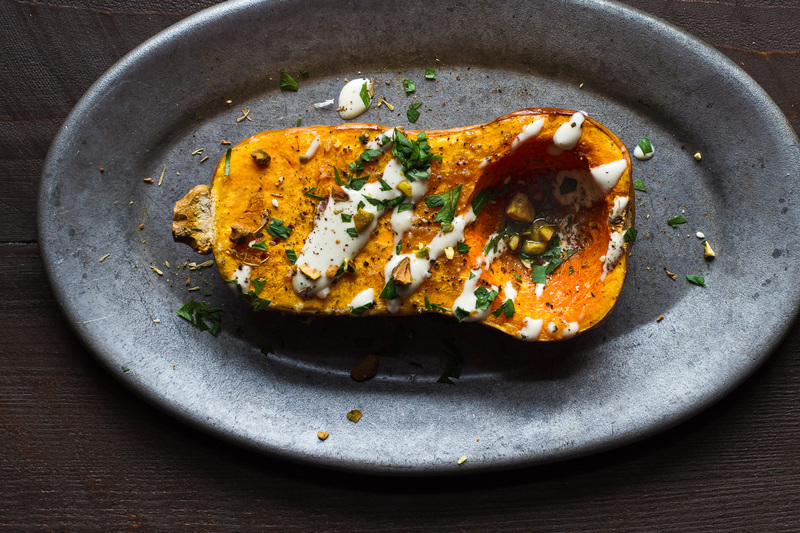 So, with the holidays coming up, I created a roasted butternut squash topped with a fresh tahini yogurt sauce and tangy za’atar. It’s easy, healthy, and makes an impressive side dish. And, it’s not more soup. 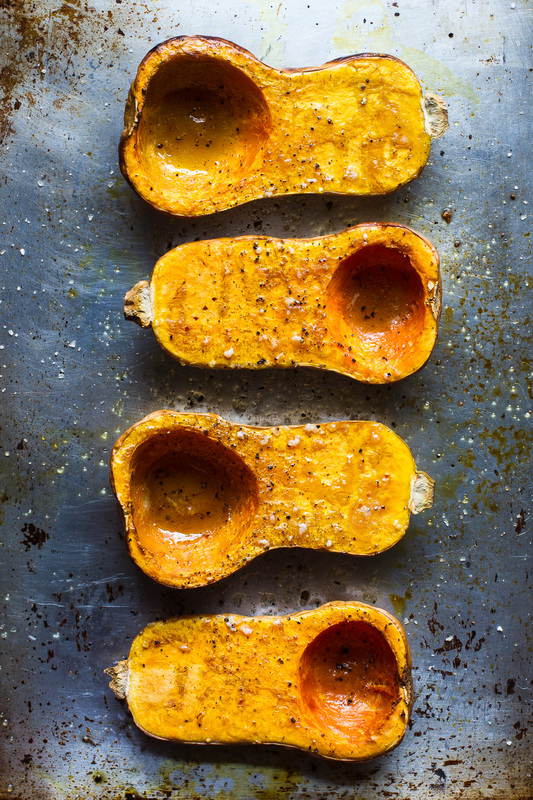 This substantial side dish highlights the seasonal flavor of butternut squash. Roasting it concentrates the naturally sweet flavor of the squash and gives the edges a bit of char. One of my favorite ways to dress up roasted vegetables like this is with spiced tahini yogurt. It’s a riff off of the immensely adaptable spiced yogurt from Travis Lett’s Gjelina cookbook and adds a lot of complexity to such a simple preparation. The recipe makes more than what’s called for, but it’s addictive and goes fast. In the rare case of leftovers, I thin it out with a little water and use it as a dressing for grain salads. You can make the spiced tahini yogurt up to a few hours in advance leaving out the lemon juice. Over time, the lemon juice can cause the yogurt loose its creamy texture. So, when you’re ready to serve, stir in the lemon juice and use right away. Serve the squash family style with something rich or fatty like roasted pork shoulder or duck. Place the butternut squash halves on a large roasting pan flesh side up. Brush each half with 1 tablespoon of extra-virgin olive oil. Season with salt and pepper and roast until the squash is soft and can be easily pierced with a fork, about 45 minutes. Remove from the oven and leave to cool. In a small, dry frying pan, toast the pistachios until fragrant, about 3 minutes. Let cool and coarsely chop. 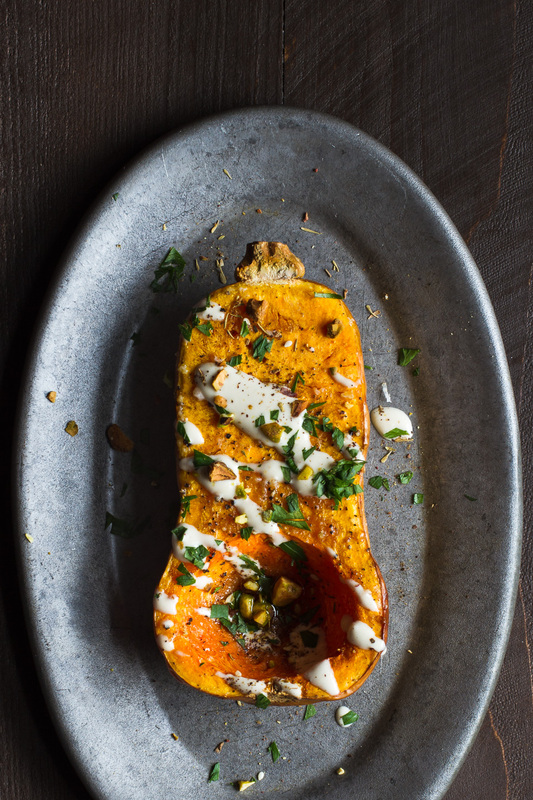 Transfer to a serving platter, drizzle the yogurt over the squash, and garnish with the pistachios, za’atar, and parsley. Season with flaky salt. Serve warm. In a small bowl, combine the yogurt, tahini, and garlic with the ground spices. Add the extra-virgin olive oil, vinegar, and lemon juice and stir just until incorporated. Taste and season with salt. Stir in the water, a little bit at a time, stopping when the yogurt is still thick but thin enough to drizzle from a spoon.